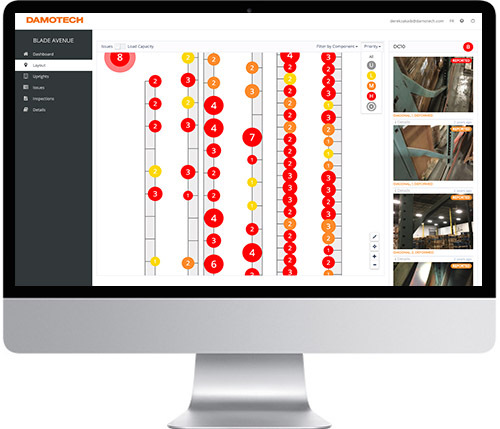 The Damotech Platform is the only rack inspection tracking software of its kind. With real-time access to rack inspections and data, warehouse operators can better manage their racking assets. Accessible through the Cloud, the platform makes it easier than ever to track your progress toward a safer warehouse. The rack inspection software provides a visual representation of a warehouse in plan view. The intuitive interface makes it easy to zoom in on locations, view the status of deficiencies and track your progress toward addressing them. You can also see a list of all inspections and deficiencies and sort them based on their priority level. For each location where deficiencies are reported, the rack software makes it easy to access data entered by our conformity engineers. View pictures taken during the inspection, flagged issues and missing components and then sort them by priority levels. Get an overview of the current state of your rack systems with a real-time dashboard. Easily monitor issue distribution by warehouse, type, components or priority level. 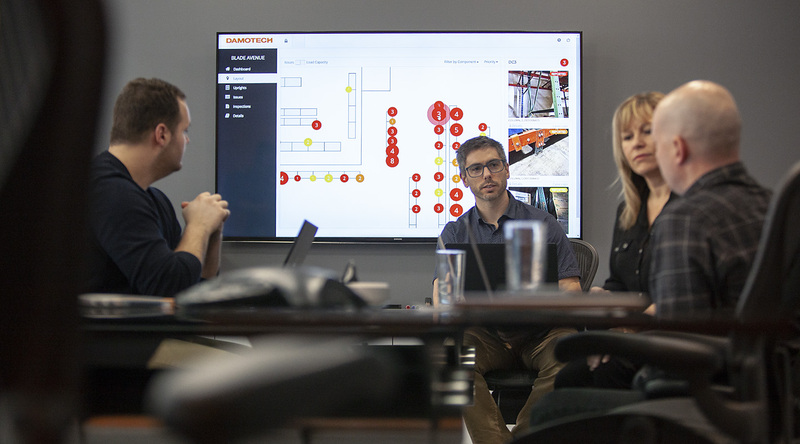 At Damotech, we believe in a future where new technologies will improve employee safety in warehouses across North America. Our teams of dedicated engineers and software developers are envisioning new ways to carry our industry forward. It's never been easier to manage and stay up to date for multi-warehouse environments. Simply login and all the data is at your fingertips. 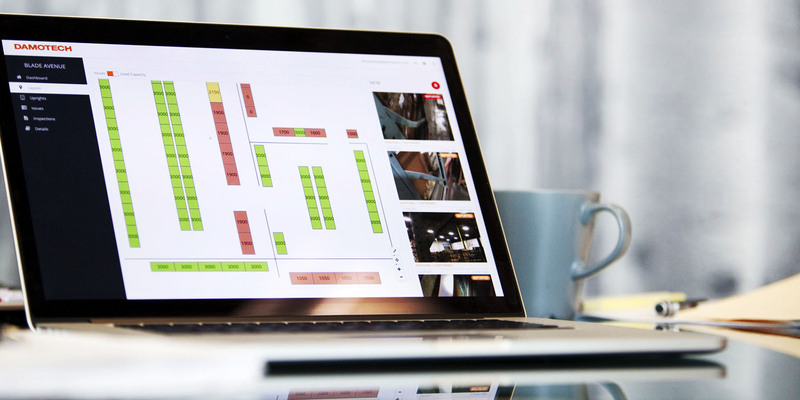 From warehouse layouts to dashboards and pictures of deficiencies, everything is graphically presented for easy viewing. The software and all your data are hosted in a secured cloud environment. That means you always have the latest version of everything and that you can access it from anywhere. 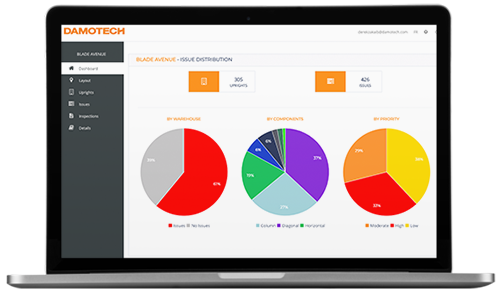 The Damotech Platform is the only software that enables you to manage your rack assets and track your progress toward a safer warehouse. Although quite powerful, the Damotech Platform was designed to be intuitive and easy to learn. Stop using paper and Excel to track your deficiencies and repairs. Access and store data from your latest inspection to easily view which deficiencies need attention. How can I create a Damotech Platform account? Creating an account is easy! Go to the My Account menu at the top of the page and click on Damotech Platform. On the Login page, you'll find a Signup button, then follow the instructions. 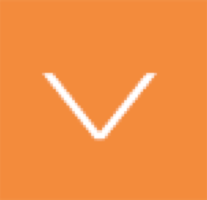 This will give you access to the Damotech Platform with demo data so you can try it out. You can also contact us to get a full demo of the Platform. How do I access the Damotech platform? Where do I login? Logging in is easy! Simply go to the My Account menu at the top of the page and click on Damotech Platform. You will be taken to the login page. Simply enter your username and password. The Damotech Platform is only available online through your web browser. It is offered as a SaaS (software-as-a-service) and everything from the application to your data is securely hosted in the cloud. That means you're always using the latest and greatest version of the software and that no software updates are ever required. Where can I use the Platform? What type of computer do I need? The Damotech Platform is available online and is accessed through your web browser, no matter where you are in the World. As long as you have internet access, any computer with the latest version of your favorite browser will give you access to the Damotech Platform. Want to learn more about the Damotech Platform and its advantages over conventional rack deficiencies tracking?